Samsung is rolling out a powerful touch-screen handset that may make carrying around a separate camera unnecessary. The main features of the M8800 Pixon will be the 8-megapixel camera that comes with built-in dual LED flash, advanced shake reduction, face-detecting technology, and auto-focusing. The camera is also capable of recording high-quality video at 30 frames per second. "Now everyone will be able to 'get their pics on' so much more quickly and easily. For the first time you will have a camera on your phone capable of delivering the quality of image of a regular digital camera," said Geesung Choi, president of Samsung's telecommunications business, in a statement. While the Pixon should make for a good camera, it also sports attractive features for the mobile professional. The 3.2-inch touch screen has an accelerometer, and it can be used as an organizer and as a Microsoft Office document viewer. For connectivity, the Pixon has 3G connectivity with a maximum download speed of 7.2 Mbps, as well as EDGE. These connections can be used to check e-mail, browse the Web with the HTML browser, or get news and weather with included widgets. 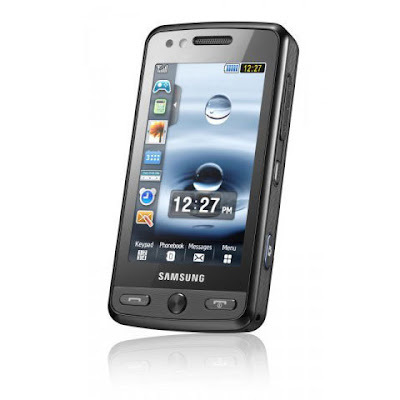 The handset also has a GPS chip for geo-tagging photos as well as assisted GPS, but the lack of Wi-Fi may turn some off. The Pixon also has Bluetooth capabilities, built-in hands-free, and the memory can be expanded up to 8 GB via a microSD slot. The Pixon's no slouch in the multimedia department, as the large screen can be used to play a multitude of video formats, including DivX. There's also a digital music player, TV-out capability, virtual surround sound, and a build-in FM radio. The handset measures 4.2 inches by 2.1 inches by 0.5 inches, and it weighs about 4.2 ounces. The company did not reveal pricing, but Samsung said the Pixon will be available in France in mid-October, and it will roll out to other markets shortly after. WiMax or 3G: Which is better? Buy brand new Nokia N96 16Gb for just $300 !